eat drink love: Pizza! Pizza! 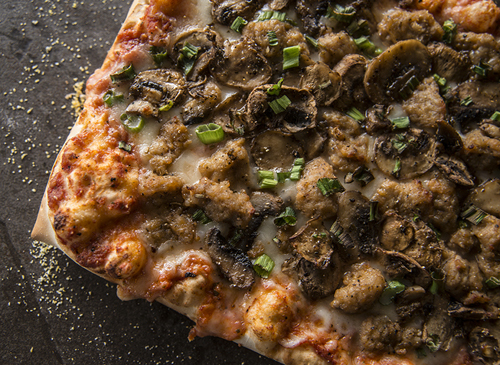 Stone Flats sausage & mushroom pizza. Photo copyright 2012 Carl Kravats. Who doesn't like pizza? There's something about the combination of bread and melted cheese with all those flavorful toppings that makes people crave it. I grew up in an Italian and Greek family and homemade pizza was the only kind of pizza I ever tasted until I went away to college. I think we had one small pizzaria in our little Midwest town, but I never would have thought of going there to buy a ready made pizza! Probably sounds absolutely absurd to you younger readers, but I grew up in the 60's and 70's and my family was a make-it-from-scratch old world family. As an aside, I'm thrilled that we're going back to more of that lifestyle that focuses on bringing family and community back together around the table. With the Slow Food movement, small organic farms, CSA's (community supported agriculture), and the ever-increasing farmer's markets we're making great strides. But the heart of this story lies in my mom's kitchen, where she still makes her pizza from scratch. The art of making pizza was a nurturing, loving process that my Great Aunt Rose taught my mom. My father's side of the family was Italian, so my mom needed coaching on how to make the pizza my father grew up eating, and my Great Aunt Rose, my grandfather's sister, was the grand matriarch of the kitchen. The dough was always made from scratch. I can still hear my mom passing down the recipe to me, "First you put the flour on your work space, and then you make a well." Remember Red Star fresh yeast? That went into a cup of "warm, not hot!" water...my job. Then the kneading, rising, and punching down (also my job) until she could finally work the dough into a large rectangular cookie sheet and slather it with olive oil. Then back to rise yet again. Finally it was time for the toppings. First finely chopped garlic, a slathering of olive oil, and a light dusting of salt, then the tomato sauce, mozzarella, provolone, and Romano, and finally fresh basil, mushrooms, and pepperoni for my dad. Then back into the oven until the edges were golden. Ahhhhh...biting into a warm cheesy slice, I knew it was absolute perfection and it was part of my family tradition. My Great Grandmother, Aunt Rose's mom, came to the US from Calabrese, Italy. We called her "Old Grandma", I suspect because we had two other grandmothers and she was older than either of them. She had a soft round face etched with time and struggles. Her white wavy hair was always neatly tucked into a fine mesh hairnet as thin as spiderwebs. When she was young with eight small children making every penny count, she would make several huge pizzas that filled the white oak table in the kitchen. But during these times, the toppings weren't lavish, simply olive oil, garlic, and salt. My grandfather told me he and his brothers loved to sneak in the house from playing soccer in the yard to steal the softest center slices. I can only imagine the silky texture and pungent garlic flavor of those first slices. These days, my husband and I try to eat all organic because we believe it is better for us and for the planet. Since my husband is gluten free, going out for pizza, as we know it, isn't always an option. Sad, sad, sad......until we found Stone Flats where we were treated to a gluten free crust with basil, tomatoes, sauteed marinated mushrooms, goat cheese, and black olives. It is marvelous, delicious, fabulous, and irrestible. Can you tell I like it? This modern day version is quite a stretch from my roots, but for today it gave me a great excuse to dote on another sweet memory from childhood. If you haven't been to Stone Flats yet, you MUST! You can check out their menu at their website. They are located at 272 N. El Camino real in Encinitas. There are loads of shops in the area; they're in the same center as KFC. The staff is great and the food superb!